Directions 1. 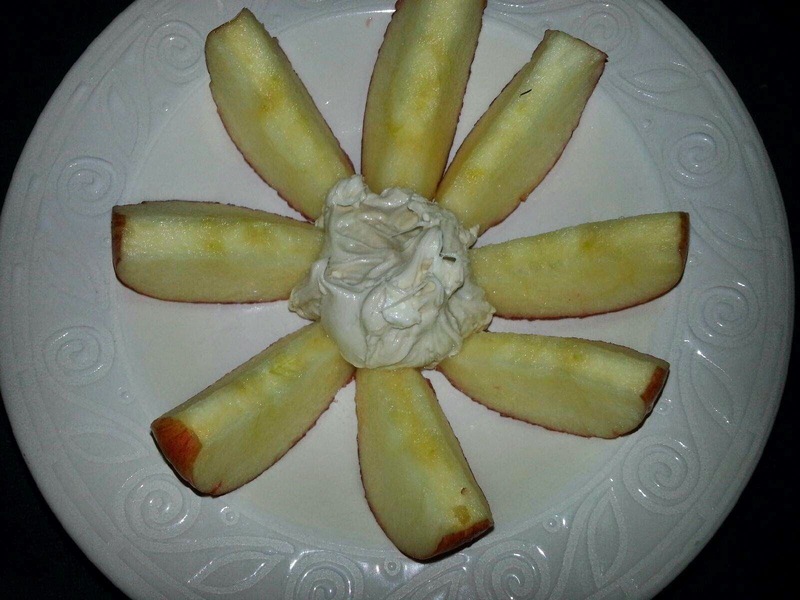 Allow cream cheese to soften at room temp. 2. Blend all ingredients with an electric mixer until well incorporated and fluffy. 3. Serve with fresh fruit such as apples or strawberries. Directions 1. Lightly oil pan and heat on medium heat. 2. Spread an even layer of cream cheese on two tortillas. Spoon about 1/4 c. of salsa on one tortilla and top with the other. 3. Cook over medium heat until tortilla is lightly browned and cheese is warmed through. Flip and brown the other side. 4. Repeat for remaining tortillas. Serve with more salsa and sour cream or guacamole. *I've used additional shredded cheese and avocado slices as well. All delicious! Quick and easy and doubles as a quesadilla filling in Mango and Cream Cheese Quesadillas! Ingredients 1 mango, peeled and diced 1/2 red onion, peeled and diced 1 c. chopped pineapple (preferably fresh) 2 T. chopped fresh cilantro juice of 1/2 a lime or about 1-2 T.
Directions 1. Mix ingredients well and refrigerate for at least an hour to let flavors blend. So easy a kindergartner can make them for you! Great as an appetizer or a quick kid-friendly dinner. Directions 1. 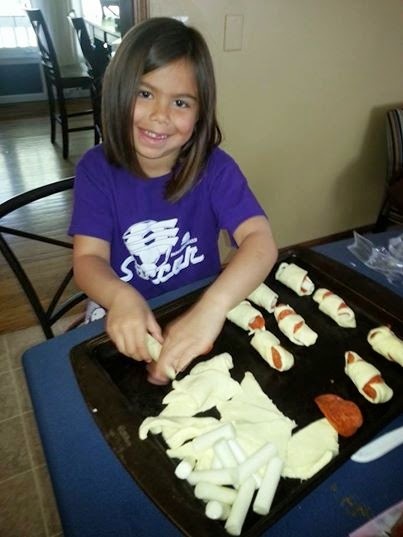 In each crescent roll, place 4 pepperonis and a cheese stick and roll up. 2. Bake at 375* for 10-12 minutes until golden. 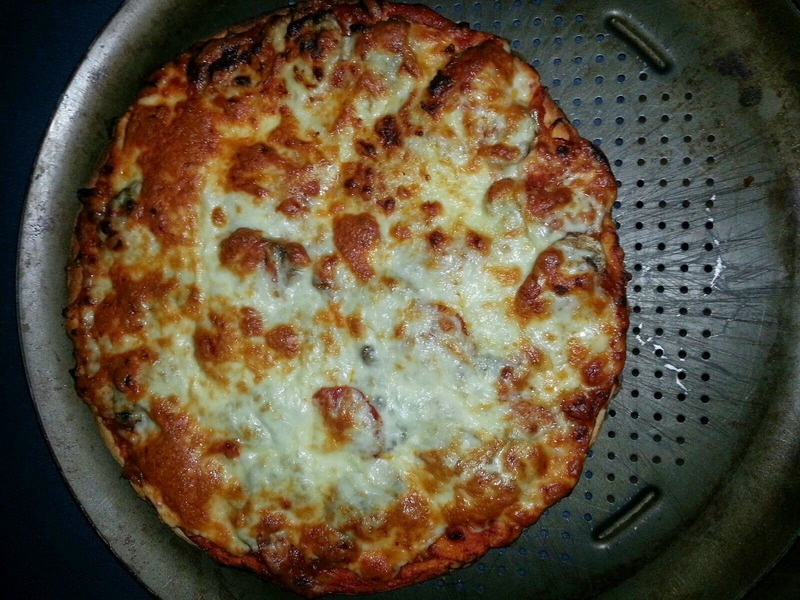 Look at this awesome pizza Carolyn made from ALDI's Mama Cozzi Thin Crust! Looks like it came from a pizzeria. 2. Combine provided sauce packet with spices and parmesan cheese. 3. Top crust with sauce, then toppings, and then mozzarella cheese. 4. Bake directly on oven rack until cheese is melted in the middle, then switch oven to broil for the last 5 minutes to get cheese golden. I always order the Mediterranean Veggie on Tomato Basil at Panera. This is my packed lunch reinvention. Fine on it's own or is great with a soup like Homemade Tomato Basil. Directions 1. In each tortilla spread about 2 T. of hummus. 2. Layer with veggies, cheese, and olives if desired. One of my favorite things about going to Nana and Papa's house was waffles for breakfast. This one is a basic staple at our house and occasionally makes and appearance on "Breakfast for Dinner" night. Ingredients 1 3/4 c. Baker's Corner All-Purpose Flour 1 T. Baker's Corner Baking Powder 1/2 tsp. Stonemill Essentials Sea Salt 2 Goldhen Large Eggs 1 1/4 c. Friendly Farms Milk 1/2 c. Oil (Canola, Vegetable, etc. - if you use coconut, then half the oil) Specialty Selected Pure Maple Syrup (8.5 oz. 100% pure maple syrup - $3.99 @ ALDI) Directions 1. Preheat waffle iron. 3. Mix in oil and milk into dry ingredients. 4. In a small bowl, beat the eggs and then fold gently into the batter. Note: If you would like to get really fluffy waffles, then you can separate the whites and beat until frothy before folding in. 5. Cook as directed by the waffle iron. Top with pure maple syrup. Happy Mother's Day and a big thanks to my mom for this recipe! Freeze the leftovers for a quick and easy weekday lunch. Directions 1. In a slow cooker combine all ingredients. 2. Cook 8 hours on low. 3. When the peas are soft, use an immersion blender or masher to blend about half of the soup leaving some chunks for texture. This one is my one-year-old's favorite but I'm not sure that means anything since he also likes to eat dog food. Before you attempt this recipe, make sure you actually like goat cheese - Carolyn is not a fan. She prefers to make this with ham and cheddar or veggie medley. Katie, however loves this one and I would eat it for breakfast, lunch, or dinner. You could use a roll-out crust, but this one with the technique adapted from 100 Days of Real Food is almost as easy and has a very simple ingredient list. Thanks to Carolyn for making these darling treats at a party recently! You can make them in little single servings or in a giant "I had a bad day" size (below). Serves 10, Cost per Serving $.45 Ingredients 12 ALDI Brand "Oreos," crushed (Baker's Corner?) 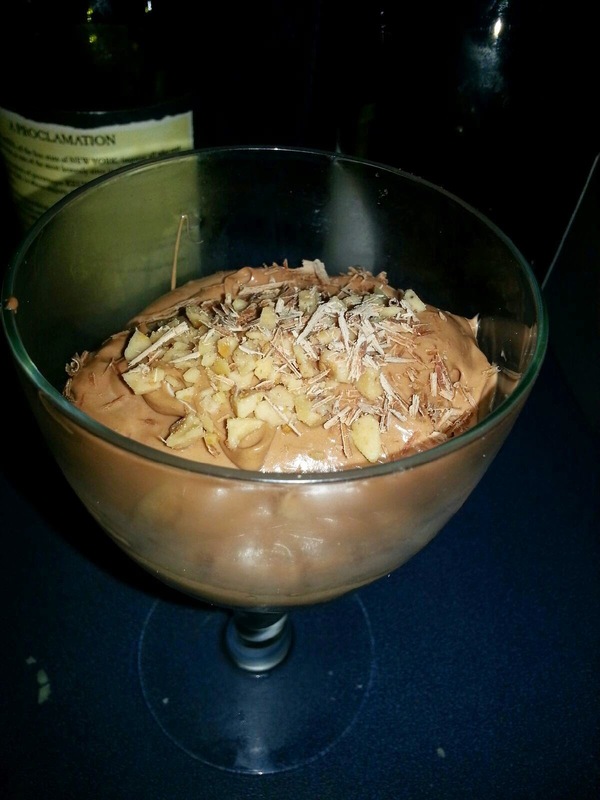 3 T. butter, melted 1 container Fit and Active Whipped Topping 2/3 c. Hazelnut Spread (Nutella) 1 tsp. Vanilla 1 block Happy Farms Cream Cheese, softened Toffee or Chocolate Bar Shavings, opt. Directions 1. Melt butter, add to crushed "Oreos". Press into individual dessert cups. 2. In mixer combine cool whip, cream cheese, hazelnut spread, and vanilla. 3. Once mixed well, spoon over cookie crust. 4. Refrigerate for 30 minutes before serving. *Carolyn put shaved chocolate and toffee pieces on hers, as well as a strawberry. 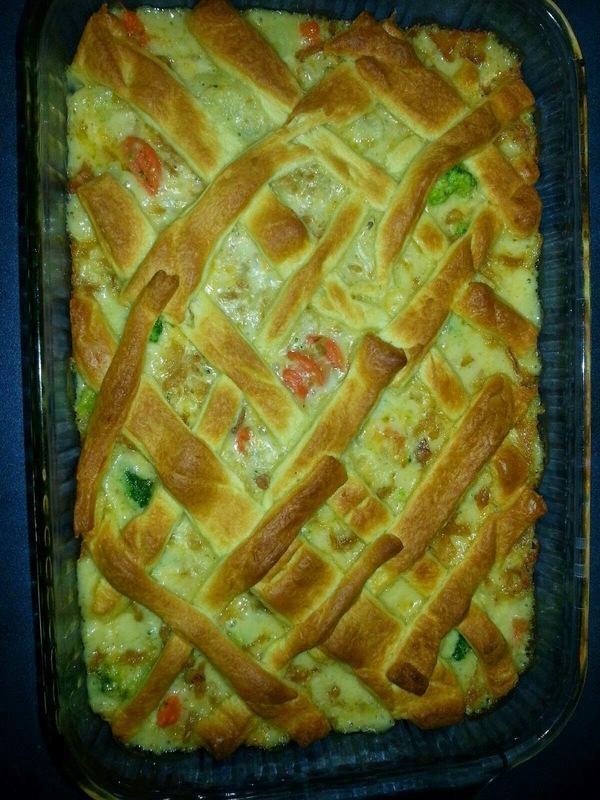 Great way to use leftover chicken from Roasted Chicken or leftover turkey during the holidays. Directions 1. In bowl combine all ingredients except the crescent rolls and pour into a greased 9x13 dish. 2. Roll out crescent rolls so they are a big rectangle. Pinch the seams to seal. Use a pizza cutter to cut into ½ inch to 1 inch width strips. Layer strips over the mixture to form a lattice look. 3. Bake at 350* for 40 minutes or until dough is lightly browned. Directions 1. In a large sauce pan or stock pot sauté onion, celery, garlic, and chilies in olive oil. 2. Add the chicken, stock, cumin, and oregano. Bring to a boil and then down to simmer. Part 2: Now that I have roasted a whole chicken, and fed my family the main cuts, I usually have quite a few leftovers. Once the chicken has cooled, I pick all the meat I can off the bones and set those aside in a container to refrigerate or freeze for other recipes like White Chicken Chili or BBQ Chicken Sandwiches. Make sure to flip that thing over and get ever little bit of meat. The remaining bones are a great start to chicken stock! This recipe is substantially less salty than canned chicken broth, so when you add it to recipes, you may need to adjust accordingly. We like to watch our sodium and only add what is necessary. This is part one of a 3-part series on what to do with a whole chicken. I have to admit that the thought of cooking large cuts of meat or whole poultry scared me for the first part of my cooking career. It seemed very "Little House on the Prairie" in the days of boneless, skinless chicken breasts in a freezer bag. If you are intimidated by these types of meals, I highly recommend getting a meat thermometer. Mine came from a bridal shower gift (Thanks, Linda D.!) and it has seen a lot of use since. It gave me the confidence to know when the inside of the meat was to temperature so I could stop overcooking everything or sawing into every cut of the chicken to make sure it was cooked!